So it has been a year and a half since my last update. Although this is true, I wouldn't say there has been nothing to report. I have become way too dependent on the social media platforms, and in turn, this site has been neglected. That being said, I have cleaned up the Media section of the site. All links to my discography have been updated and are in working order. 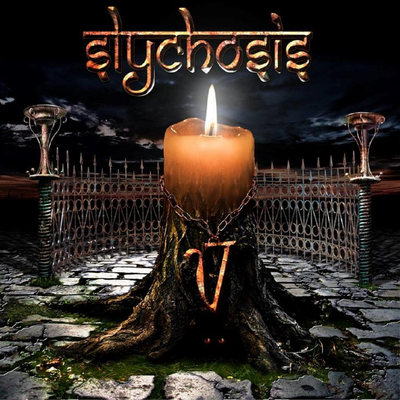 Speaking of discography, the latest Slychosis album that I have the pleasure to appear on, was released a few weeks ago and it has been added there. The artwork is featured above. Head over to the media section for ways to purchase it digitally and look for physical copies to be made available very soon. Dysinger is still going strong despite Chad leaving the band to pursue original music. John Slater has been playing bass for a handful of shows now and he is fitting in nicely if I do say so myself. Be sure to check out the Performance section of the site to keep up with upcoming shows. There are a few things on the books right now for the group. I am still working with Rich Fyhr and we are putting together a great power trio with Shaun Alexander on bass. Look for us to play out soon. Also, I am working on another original project. Although, I can't really say much about it at this time, I am very excited about what we have been doing so far and look for an announcement concerning it, towards the beginning of next year. Until next time, always check out the social sites listed at the bottom of the page for more frequent updates. As it always seems to be with me musically, it is either feast or famine. Not really sure if that is a testament to seasons in life or a byproduct of laziness, most likely the latter. Regardless, I have some news to report musically. First if you saw my previous teaser update and you have been paying attention to Facebook, it will not be a surprise to announce the resurgence of Dysinger!!! 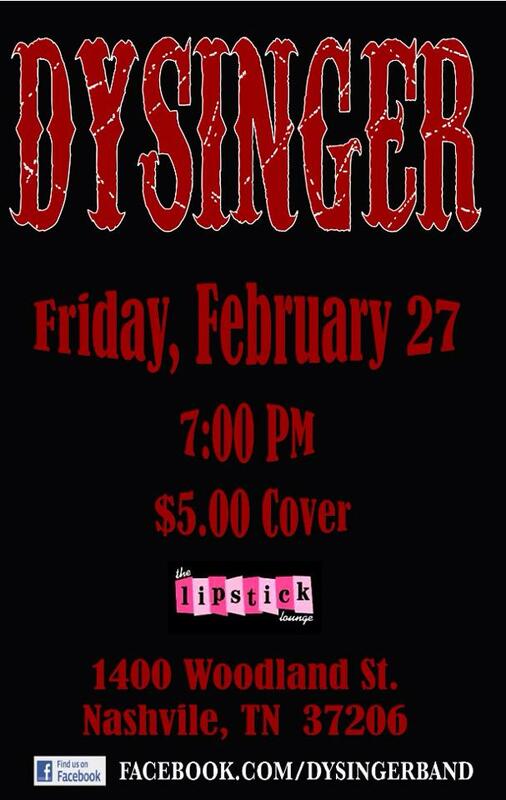 We will be playing our first show on February 27th at The Lipstick Lounge. Also I am very excited to announce the return of Andrew Morsla on lead guitar! Those who saw the band pre 2014 know what kind of force he is and I am eager to start playing with him again. As for the rest of the band, it is the usual suspects. Chad Grant on low end, Sean Nicholson on rhythm and some tasty lead licks, and of course Leslie on vocals, guitar, and other forms of verbal mischief. We have already gotten a few rehearsals in the books and things should be more than ready come the 27th. There has also been a bit of buzz already surrounding this show. If you are planning on attending, I suggest getting there early just to make sure you can get in. Hope to see you there. Second, I am now excited to announce a project I alluded to back in May of last year (geez!!!). I have been working since that time (off and on) with a very talented singer/songwriter by the name of Rich Fyhr. We have been working together trying to figure out the best way to present his music. We have experimented with a traditional full band set up, we have stripped it down, we have worked on song arrangements, etc.. etc.... and we finally feel we have something to present to you all. We will be playing our first show at the Commodore Grille on May 22, 2015 and this will be done as a duo. More information about the event can be found here. This will be my first time to play out with Rich and also to grace the stage at the Commodore Grille. I hope everyone can make it out and experience this exciting new chapter with me. As always it is time for a long overdue update. It is hard to believe it has been almost a full year since my last formal update. Sometimes reliance on social media to do the informing can be a bad thing. I have a few changes to discuss regarding me musically. First, Dysinger has decided to call it a day. With various setbacks and differences within the group regarding which direction to take as a band, it was decided to move forward separately musically. We are all still very close and enjoy playing music together. However, it is time to see where we go in the next chapter of our lives musically. I want to thank Sean for having the belief that I would be a good fit for the Dysinger band and pushing for my audition. I also want to thank Leslie for that faith as well. Through the years, I have had a tremendous amount of joy playing with both Chad and Sean through various projects and their professionalism is something that is always refreshing. Leslie, you are one of the best vocalist I have had the pleasure of working with and I am sure you will do well focusing on original material. I also do not want to forget my time working with Drew. Drew you are like a machine on the guitar, playing solos note for note as if you were the one who cut the track. I have cherished the time I have spent with all four of you musically and you have taught me a lot. Thank all of you for that. 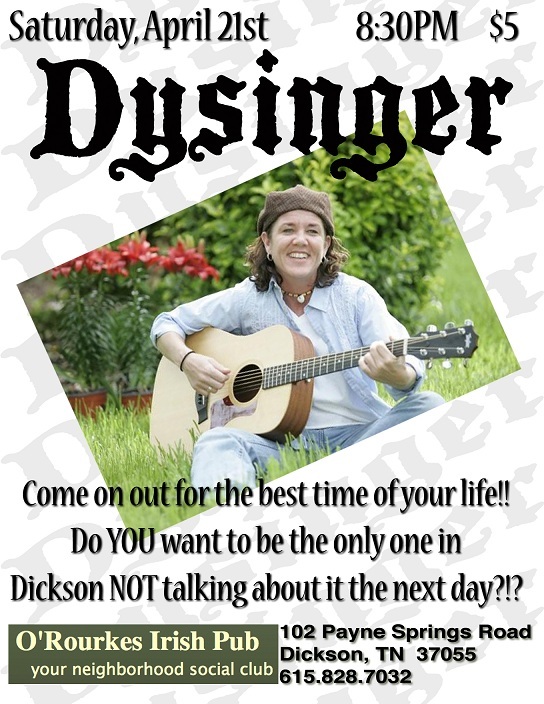 Be sure to come to Dysinger's final performance on June 13th. This should be a rowdy fun celebration of the life of the band. As always, when one door closes, another one opens. Second, I would like to let you know that I have been working with a singer/songwriter for over a month now and the songs are coming together nicely. We have a rocking bass player and in my opinion are putting together a nice solid trio. We have been spending most of our time shaping these songs by working on arrangements and individual parts. I am very excited to say that we are very close to getting to a point of recording a demo and once we are ready to present audio, I will let you know more about who all is involved in this. At this time, I can say that these songs are some of the most commercially viable songs that I have been a part of and I am excited to see this project take flight. Finally, I plan on trying to put more time and effort in finding the clientele for the instrumental project I have been trying to get off the ground for several years now. Hopefully, I will have some news to report on that front soon. Since it has been a while for a formal update, I thought it was time to provide one. I have a couple of cool things to report. If you follow me on Facebook then you should be aware of one of these items and I have also alluded to the other there as well. Be sure to like my Facebook page if you haven't done so already. This is the best way to keep up to date of my musings. First off, I am excited to announce that my first public hand percussion gig since moving to Nashville will be a week from today, June 8th at Two Old Hippies with Dysinger. The show starts at 5:00 PM. We will be playing a lot of new original material as well as some new to us covers. This performance will also be my first during CMA Fest. I am very excited for the opportunity. Go to the Performance section of the site to learn more. Hope to see you there. Secondly, I finished tracking a song for the upcoming Proximal Distance album. It is always a pleasure to work with Gregg and the tracking of the song hit the box very smoothly. I am looking forward to seeing how the final product comes out. Look for more information regarding this release in the upcoming months. It is with a heavy heart that I have to inform you we lost a great force in Mississippi's Music Scene today, Lee Perry McGlaun. I had the pleasure of working with Lee in various incarnations of his musical journey. Most notably he was the lead vocalist and a founding member of the group Funk Shack Five. Although I have many great musical memories with Lee, it is our mutual love for Auburn Football that I will remember him by the most. I will miss our calls before, during, and after Auburn games relishing in the victory or comforting each other in defeat. It truly saddens me to send out one last WAR EAGLE!!! You will be missed my friend. Arrangements and further details regarding paying respects will be posted at Ott & Lee Funeral Home's website. As always, it is time again for another long overdue update. As I am sitting here reflecting on the past year and how things have changed for me musically, I bring you yet another change to report. Some of you are already aware that Andrew and The Leslie Dysinger Band have parted ways. Since then we have been in the lab trying to redefine our sound. We even did a one off show as a four piece. After that show was finished we knew that at this point, it would be in everyone's best interest (including the fans) to remain a four piece project. What better way to formally introduce the "new" band, than at a New Year's Eve gig!!! There will be lots of surprises at this show as well. We have learned a bunch of new songs, acquired new gear, and even a new name!?! 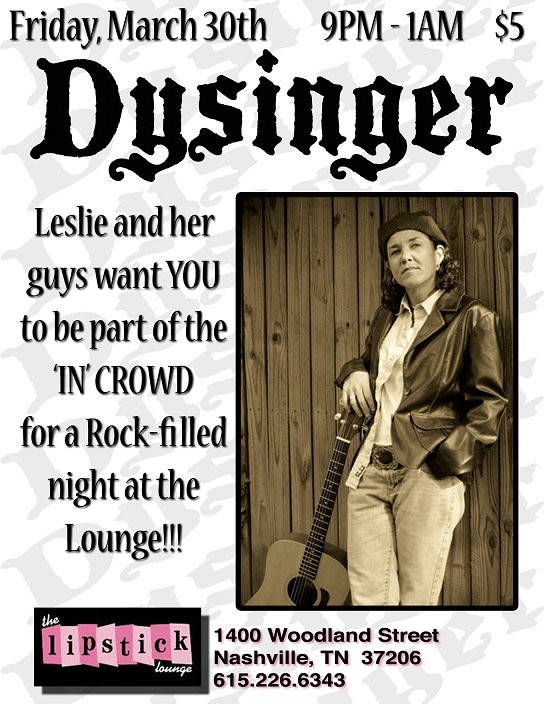 That's right, as shown in the flyer above, The Leslie Dysinger Band will now be known as Dysinger moving forward. So come on out to Dickson,TN this NYE to celebrate the turning of the page not only for the year but for the band as well. This is going to be a show that you will not want to miss. Go to the Performance section of the site to learn more. Hope to see you there. I am sitting here watching Bowling for Columbine and thinking about the fact that Aurora is 17 miles from Littleton. My old band Lucid Harmonic has a song that discusses the topic of using weapons to deal with confrontation. So sad that such a tragedy has effected one community on multiple occasions. My thoughts are with those affected. I wanted to let everyone know that if you are going to be in the Nashville area next weekend you will have two opportunities to see me perform with The Leslie Dysinger Band. The first will be at The Lipstick Lounge on Friday the 15th at 8:00 PM. The second will be at The Nashville Pride Festival on Saturday the 16th. We will be on the local stage and perform around 10:30 AM. Go to the Performance section of the site to learn more. Hope to see you there. I am excited to finally announce that the new Audio Player is up in the Audio section of the site. This will show a wide selection of my works over the years and is fair representation of my career up to this point. I am still trying to compile more music, so check back from time to time as I will continue to add more. A lot of its content I have had to reach out to others to get copies of. Because of this, I want to say thanks to all who have helped to contribute, you know who you are. Let me know your experiences with the player and if you have any suggestions for content that you feel should be added. Thanks in advance for listening. 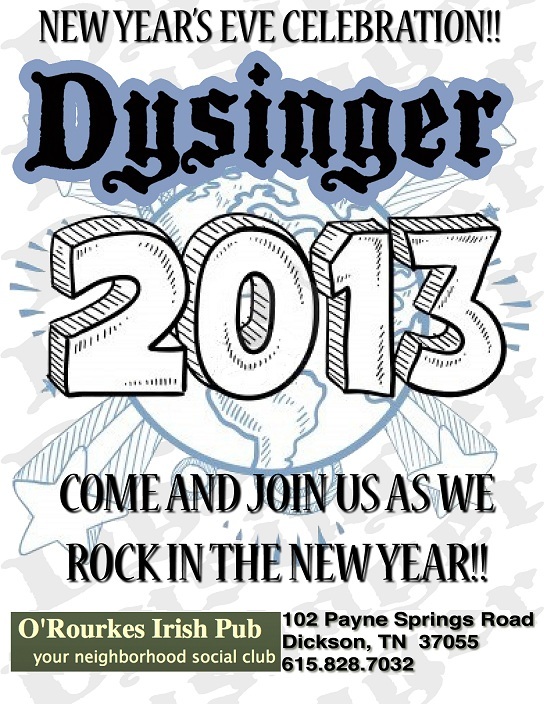 I will be performing with The Leslie Dysinger Band this Saturday at O'Rourkes Irish Pub in Dickson, TN. Show start at 8:00 PM. Go to the Performance section of the site to learn more. Hope to see you there. I also will begin working on a new original project this Friday. Hopefully there will be more information to report soon in its regards. I am also putting the final touches on the new audio player that will be added to the website soon. It will have a wide range of tracks that will be representative of all of my works over the years. I am very excited to roll it out. My debut performance with The Leslie Dysinger Band has been moved up to next Friday March 30th at The Lipstick Lounge in Nashville, TN. Show starts at 8:00 PM. Go to the Performance section of the site to learn more. Hope to see you there. Unfortunately, due to some internal changes within The Leslie Dysinger Band, my debut will be postponed until the end of April. As much as I was looking forward to the show that was scheduled for the 10th of March, this will give me more time to get acquainted with the group both musically as well as personally. This should also make for a better product as well. I look forward to seeing you guys soon and thanks for understanding. So there has not been much to report concerning my music for the majority of winter. Funny how music has a tendency to hibernate from time to time. However, I have been at work behind the scenes and now I finally have some news to report. First off, I have finally begun playing out with Rob Everest. We have been playing some private events to kick things off but look for our first public offerings very soon. Secondly, I have been working with Sean from Ashley Hart & Nashville Sky on one of his other projects The Leslie Dysinger Band. My first performance with the group will be on March 10th at O' Rourkes Irish Pub in Dixon, TN at 8:00 PM. Hope to see you there. Finally, with regret Ashley Hart & Nashville Sky have decided to back off our efforts and go on a hiatus. We may pop up from time to time for an ocasional gig here and there. At this time we are not sure to what extent the hiatus will be. I want to thank Chad, Ashley, Rick, and Sean for the time we spent together and the experiences we have had as a band. I look forward to seeing what the future holds for each member in their future endevors and who knows maybe you will see us all on the same stage again soon.